His perspective on ideas and craftmanship has been broadened by his frequent contact with craftsmen in other countries. He has served as a judge for many international competitions, and he has been invited as a guest of honor to nations such as Japan and Russia. As he inherited his talent and training from his father, he carries on the tradition by teaching his son Joaquim;further strengthening the deeply rooted instrument making tradition, initiated by Domingo Capela. 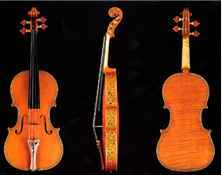 Antonio’s message about violin making: For me, it was a pleasure and a challenge to make a copy of The “Hellier”violin, specially for two reasons: Only a few violinmakers have done it. The model itself touches me by its beauty and aesthetic expression.